As an event planner preparing for my own wedding, I thought I would share some of tips I used when it came to my own wedding so readers might be able to use if planning own wedding. 1. Start with a budget in mind. How much can you and your fiance(e) afford? There are a lot of templates online you can look up. Don’t forget to add in extra contingencies on your budget such as a rain backup plan, extra items like bridesmaids/groomsmen gifts/rehearsal dinner, insurance and SOCAN fees at venue, etc. 2. What date/time did you want to host your event? When I was planning, I gave myself a year since in the summers in Vancouver venues can be hard to book as weekends are very popular. Have a few backup dates in mind just in case your first choice is not available. Also when I was planning, the Chinese calendar didn’t allow for a Saturday wedding date that I wanted as it was bad luck so I ended up choosing a Sunday. Depending on budget this might be a cheaper option or a weekday if you are having a small wedding. 3. Where do you want to host your wedding? A hotel? golf course? restaurant? church? park? There are many options. Smaller weddings may opt for a chapel/park/restaurant or even a backyard wedding. As I had a larger wedding at around 180-250 budgeted, I had to source a bigger alternative. Since I didn’t want the typical hotel or Chinese banquet dinner, I had to think creatively and ended up booking The Columbia in New Westminster. It was a cabaret style theatre hall, with a great stage and dance floor, along with tiered seating. New Westminster may not have been my first choice of space but this city houses a lot of unique venue spaces and picturesque backgrounds for wedding photos as well. Think outside the box. 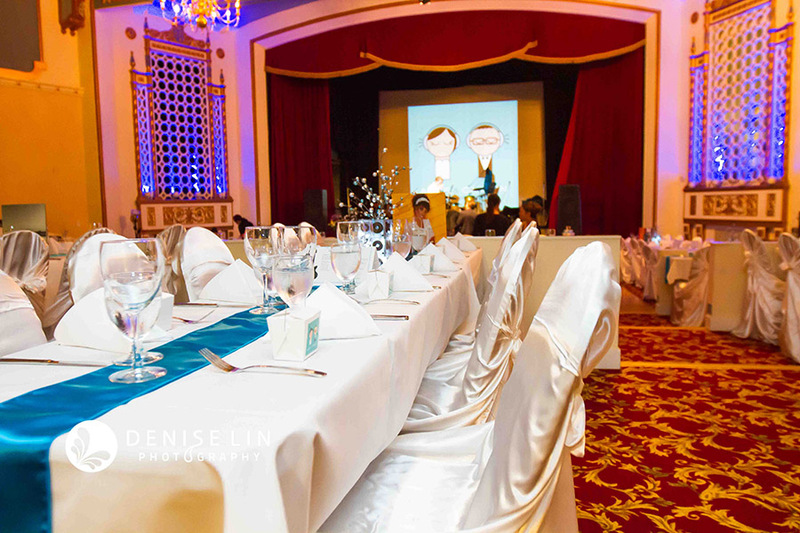 Don’t be afraid to source venues normally not used for weddings and ask. Sometimes these hidden gem venues are more budget-friendly and/or customer-oriented and super helpful. What’s your timeline like for the day? Start backwards – when would you like your reception to start and end, then work backwards to figure out when you need your ceremony, day of photos, any cultural ceremonies, and when you need to start your day (for brides make sure to factor in 2-3 hrs for hair and makeup). Work with your photographer afterwards to tweak the schedule as required. 5. Book your vendors early! To find quality vendors, book as early as when you have set your date and booked your venue. Good quality photographers, caterers, musicians, and makeup artists book up fast. Also, when booking vendors – make sure you get quotes from a few of your choices you have narrowed down. For example, I had narrowed down photographers based on my own research and referrals by other/reviewing their portfolios, and requested quotes and meetings from 2-3 photographers before selecting my photographer, Denise Lin photography. I did the same for caterers and makeup artists. Don’t be afraid to negotiate with them before signing a contract. Usually there’s room to move depending on what you want out of your suppliers. Make sure you book a legal marriage officiant for the day of. No you can’t have someone in BC take a course online and marry you off. However, marriage commissioners in BC are pretty affordable as they charge $75+tax+travel fee to conduct your ceremony. If you are getting married at a church, the priest/pastor/reverand can do that for you as well. Also, don’t forget to apply for your marriage license. You will need to have it signed on the day of and then the officiant will submit it to the government to have it made official. To save money here’s a few DIY tips – however be forewarned as it takes more time. – Make your own wedding bouquets. Fresh flowers cost quite a bit, so be creative and make your own. Best part is that you can change it up to the day of and keep them after as keepsakes. I purchased my quality silk flowers from Michael’s and bought them with discount coupons you can find on their website. – Make your own wedding cake. Fresh or fake this is more cost efficient than purchasing. However I would not recommend making your own fresh cake if you don’t have time to make it the day prior. However with fake cakes since it’s just styrofoam and fondant, this does not have to be refrigerated so you can premake it the week prior if you want. – Make your own invitations and programs. There are a lot of wedding templates you can find online, as well as invitation/program kits you can purchase at Michael’s or online. This will save money vs ordering custom ones online or at a print shop. For those thinking on a budget – think outside the box! You don’t have to spend a lot to make things look like a million bucks! What you want to make your wedding unique might be as simple as making your slideshow themed or creating a very interesting opening dance with your bridal party. For my wedding we had a music theme where the centerpieces were handmade out of cassette tapes and cds! We then used old vinyl records as the table numbers. These didn’t cost a lot but was a hit with our guests and showcased what we loved as a couple. 9. Keep referring back to your budget. While booking items for your wedding and purchasing items, keep referring back to your budget to ensure you don’t break the bank. What’s the point of having the wedding of a lifetime if you end up having to take out a line or credit or spending your honeymoon money? Make sure to budget for a honeymoon as well! 10. Have fun on the day of! It’s easier said than done, but make sure on the day of to have someone else coordinate everything for you. I trusted a couple of my friends to look after day of coordination, which was a hard task for me as an event planner. However, I went with whatever happened on the day of, focused on me for once, and enjoyed the day and so did everyone else that came! Good advice on wedding planning. I thing the most important things are the venue and caterer. These are things that you need to do a lot of research on.